Asymptomatic, low-risk patients account for up to 45 percent of unnecessary “screening”. Testing should be performed only when the following findings are present: diabetes in patients older than 40-years-old; peripheral arterial disease; or greater than 2 percent yearly risk for coronary heart disease events. American College of Cardiology Foundation Appropriate Use Criteria Task Force, et al. ACCF/ASE/AHA/ASNC/HFSA/HRS/SCAI/SCCM/SCCT/SCMR 2011 Appropriate Use Criteria for Echocardiography. J Am Coll Cardiol. 2011 Mar 1;57(9):1126-66. PMID: 21349406. Dowsley T, et al. The role of noninvasive imaging in coronary artery disease detection, prognosis, and clinical decision making. Can J Cardiol. 2013 Mar;29(3):285-96. PMID: 23357601. Hendel RC, et al. ACCF/ASNC/ACR/AHA/ASE/SCCT/SCMR/SNM 2009 appropriate use criteria for cardiac radionuclide imaging. Circulation. 2009 Jun 9;119(22):e561-87. PMID: 19451357. Natarajan MK, et al. Canadian Cardiovascular Society position statement on radiation exposure from cardiac imaging and interventional procedures. Can J Cardiol. 2013 Nov;29(11):1361-8. PMID: 24035289. Taylor AJ, et al. ACCF/SCCT/ACR/AHA/ASE/ASNC/NASCI/SCAI/SCMR 2010 appropriate use criteria for cardiac computed tomography. J Am Coll Cardiol. 2010 Nov 23;56(22):1864-94. PMID: 21087721. Don’t perform stress cardiac imaging or advanced non-invasive imaging as a pre-operative assessment in patients scheduled to undergo low-risk non-cardiac surgery. Non-invasive testing is not useful for patients undergoing low-risk non-cardiac surgery (e.g., cataract removal). These types of tests do not change the patient’s clinical management or outcomes. Fleisher LA, et al. ACC/AHA 2007 guidelines on perioperative cardiovascular evaluation and care for noncardiac surgery. J Am Coll Cardiol. 2007 Oct 23;50(17):e159-241. PMID: 17950140. Cardiac Care Network. Standards for provision of echocardiography in Ontario [Internet]. 2012 [cited 2014 Feb 19]. 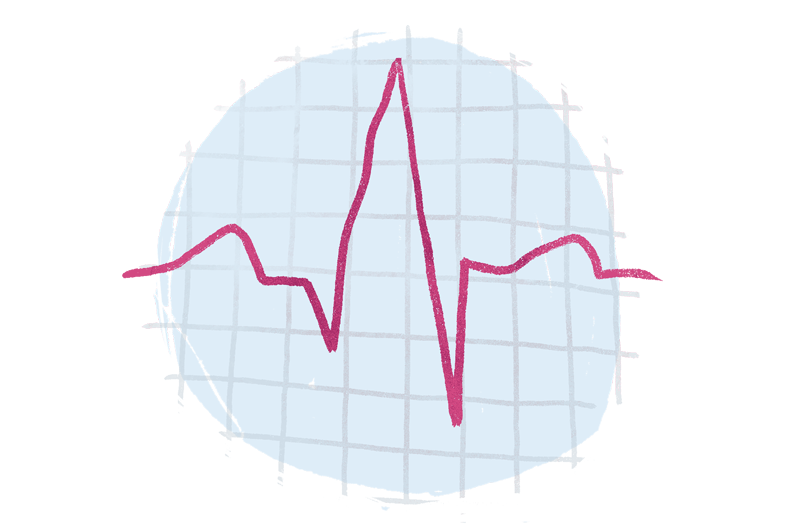 Don’t order annual electrocardiograms (ECGs) for low-risk patients without symptoms. Don’t obtain screening electrocardiogram testing in individuals who are asymptomatic and at low risk for coronary heart disease. In asymptomatic individuals at low risk for coronary heart disease (10-year risk <10%), screening for coronary heart disease with electrocardiography does not improve patient outcomes. U.S. Preventive Services Task Force. Screening for coronary heart disease with electrocardiography [Internet]. 2012 Jul [cited 2014 Feb 19]. The Canadian Cardiovascular Society (CCS) established its Choosing Wisely Canada top 5 recommendations by working closely with the American College of Cardiology (ACC). The ACC provided the CCS with the literature review, complete to 2009, that had informed their top 5 recommendations. This provided a strong foundation for the CCS to begin its investigation into relevant top 5 recommendations for cardiac care in the Canadian context. The CCS then conducted an extensive literature review to include all relevant publications since January 1, 2009. Moreover the CCS also included all relevant existing Canadian Guidelines, any Canadian appropriate use criteria and Canadian national or provincial policies that pertained to the five statements. The CCS then performed an extensive dissemination and consultation with its membership via email, Facebook, Twitter, the annual national meeting and webinars to ensure awareness and approval of the top 5 recommendations. The first four items were adapted with permission from the Five Things Physicians and Patients Should Question, ©2012 American College of Cardiology. Item 5 was adapted with permission from the Five Things Physicians and Patients Should Question, ©2012 American College of Family Medicine. Toolkit: Drop the Pre-Op A toolkit for reducing unnecessary visits and investigations in pre-operative clinics. North York General Hospital achieved a sustained 30-40% reduction preoperative assessments and investigations using the approach in this toolkit.